Safe & Secure Automated Self=Storage recently partnered with Tradewinds Elementary students to “store” a time capsule dedicated to environmental preservation inside a 5 X 5 storage room. 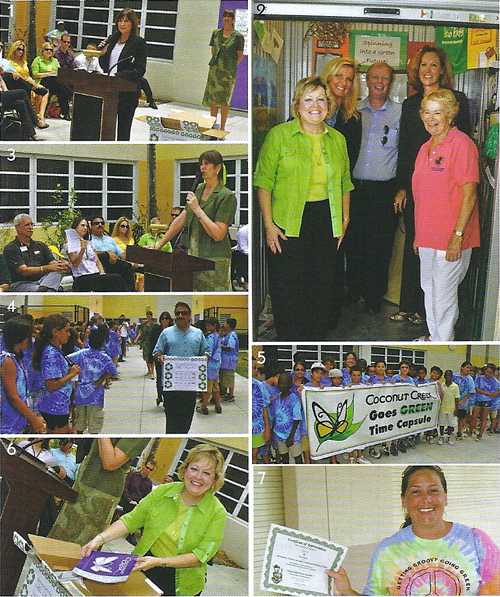 In an effort to emphasize the importance of living green and planning to ensure a green future, the time capsule contains environmental items and information that were contributed by students and staff at Tradewinds Elementary School, The City of Coconut Creek, The Broward County School Board, The Broward County Environmental Protection and Growth Management Department, Safe and Secure Automated Self Storage, Automated Self Storage Systems, LLC and The Pugliese Company. And they even placed a Coconut Creek Life Magazine inside!! The capsule will be opened in 2017 when this 5th grade graduating class will be graduating form high school. In addition, Anthony V. Pugliese of The Pugliese Company, announced that a $3,000 scholarship will be presented to one of the Tradewinds kids who’ll be graduating high school in 2017. May Lisa Aronson; Deputy City Manager Mary Blasi; City Manager Dave Rivera; Director of Sustainable Development, Sheila Rose; & Commissioner Marilyn Gerber stood inside of the storage room that house the Time Capsule. Dr. Susan Whiting, Principal of Tradewinds Elementary, encouraged students to be “thinkers” of the environment. Mayor Lisa Aronson placed CC’s Popular Annual Financial Report, maps, the City’s Green Plan, our Coconut Creek life Magazines, &amp; a DVD in the Time Capsule. 5th Grade Teacher Erin Gaylor received a Certificate of Appreciation for her work on the time capsule event.